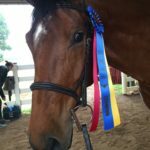 Ali joined the Blue Skies Stables Hunter Jumper Show Team in June of 2016 and spent her first year training to compete under the watchful eyes of Sally Henry. She is one of the sweetest, nicest mares you’ll ever get to hug and love on, but when she gets in the ring she can really move. The second half of 2016 was all about training, but she won Grand Champ in 5 of the 6 C rated shows she partook in, and 2017 has been off to a great start for this fantastic Hunter!